The interpersonal constellations recorded by Marguerite of Navarre in her Heptameron date 450 years back and yet are of timeless topicality. By fascinating technical means Gerhard E. Winkler permits these stories to develop freely, letting the protagonists directly influence the form of the composition and the development of the music via infrared, ultrasound or video sensors: an operatic net woven anew during each performance, "a new chapter in the discussion of open form in composition“ (Computer Music Journal, New York) – and a remarkable recording. The composer himself refers to his Heptameron as a "theater of relations:" "Everything that happens on the stage is a direct expression of the relations among the 'characters' on the stage. These relations affect not only the actions on stage but also the live electronics as well as the real-time generation of the musicians' scores, who mostly play from computer screens." 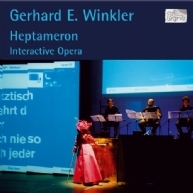 Thus the "narrative seeds" of the Heptameron are continuously redeveloped and grow into an immensely lively musical drama, which is more than adequately preserved by this recording of a performance at ZKM Karlsruhe. Polyharmony, Tone Cluster and Counter Rhythm: the three movements of Henry Cowell’s piano concer-to of 1928 (very nearly) reveal the essence of his oeuvre. Focussing and magnification, concentration and expansion – these [...] diametrically opposed dynamics [...] characteristically pervade Luke Bedford’s music.